In all seriousness, I left Yo-Yo Ma’s special talk on “Culture, Understanding, and Survival” thoroughly convinced that he might be one of the coolest people on the planet. After running onto the stage in a fashion more akin to a rock star, and a far cry from the stiff persona one might stereotypically expect of a virtuoso classical musician, Mr. Ma suggested that the evening begin with a bit of music. Then, to the audience’s confusion, he walked over to the grand piano onstage (“I think I left my cello in the taxi,” he joked, even though it was laying on the stage in plain view right behind him) and played the theme from Bach’s Goldberg Variations. 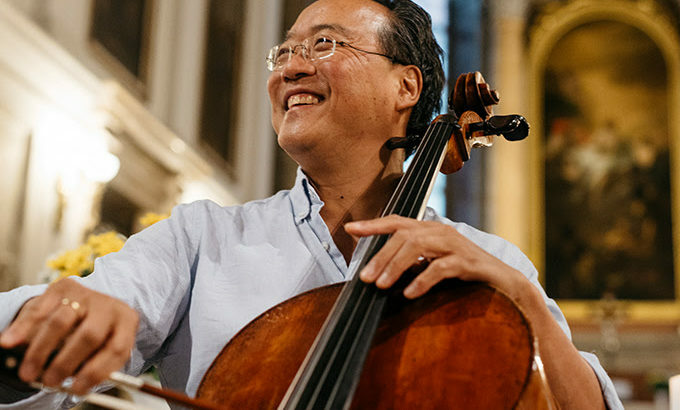 It was a simple, nontechnical melody, but placid and contemplative at the same time, and it was evident that Mr. Ma’s musical skill is not confined to the cello (Did you know that he holds a degree from Harvard…in Anthropology?). Mr. Ma’s wisdom and humility was evident, even from the back of Hill Auditorium’s upper balcony. As he wove together his own experiences and wisdom, but his focus was never really on himself, but on the shared human experience. He spoke with admiration of cultural citizen exemplars Michelin-starred chef José Andrés, French artist JR, and Mr. Rogers. He made it clear that he’s not any different from the rest of us in the audience (albeit much, much better at the cello!). At the end of his talk, he recalled this quote, “to arrive where we started / And know the place for the first time,” as he again sat down at the piano and played, for the second time, the theme to Bach’s Goldberg Variations. And he was right. The music, when heard a second time with Mr. Ma’s imparted wisdom swirling around my head, sounded hopeful and forward-looking, which is perhaps a reflection of the way I felt at the talk’s conclusion.